Your membership also secures access to great range of local benefits as well as accessing libraries and other facilities. * ALL-INCLUSIVE** access to all High Life leisure centres is just £31.00 per month for the family or £20.60 per month for an individual, payable by monthly direct debit. You can also buy an annual all-inclusive family membership for £372 or an annual individual membership for £247.20. ** BUDGET** access to all facilities: pay just 50p per activity if your household is on: Income Support, Pension Guarantee Credit, Job Seekers Allowance or Employment Support Allowance, or individuals on War Disability Pension, Disability Living Allowance, Personal Independence Payment (from 10 June 2013), Attendance Allowance or Carer’s Allowance. 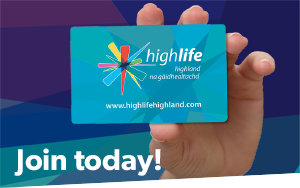 To become a High Life member just choose which of our affordable payment options is best suited to you and start your membership by completing this Membership Form and returning to your local leisure centre, or apply in person at your nearest High Life outlet.